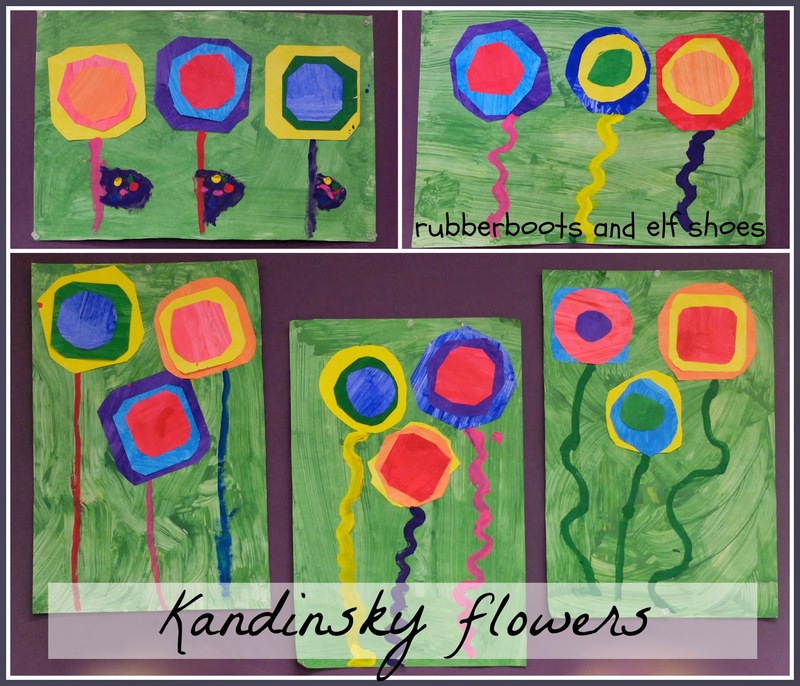 We are fans of Mr Kandinsky circles. This year, we wanted to "Spring" it up a bit. 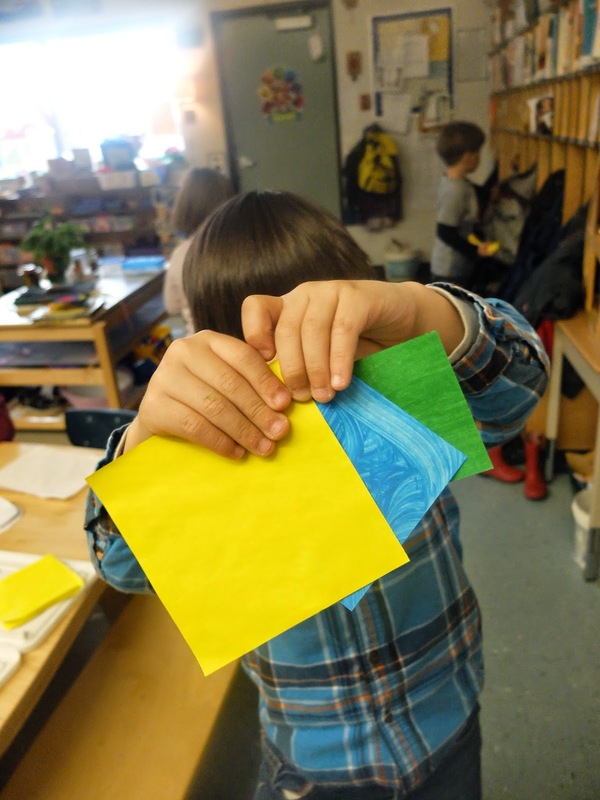 First we painted a bunch of papers with sponges, making lovely texture marks. I cut the papers into 3", 4" and 5" squares. 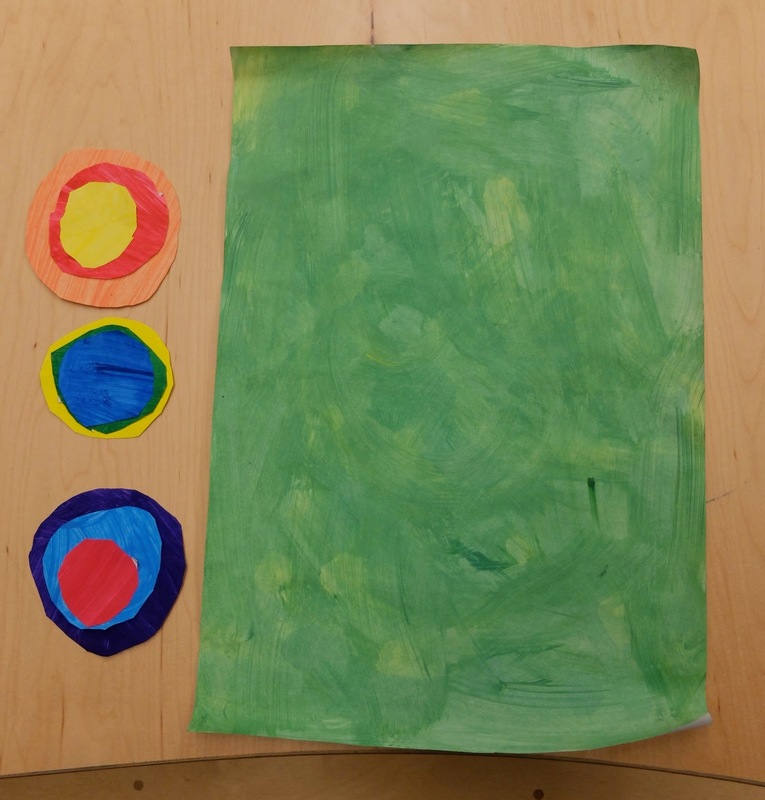 The kidlets needed to make sets of circles. An odd number always looks good. But more importantly, we were learning about colour theory. 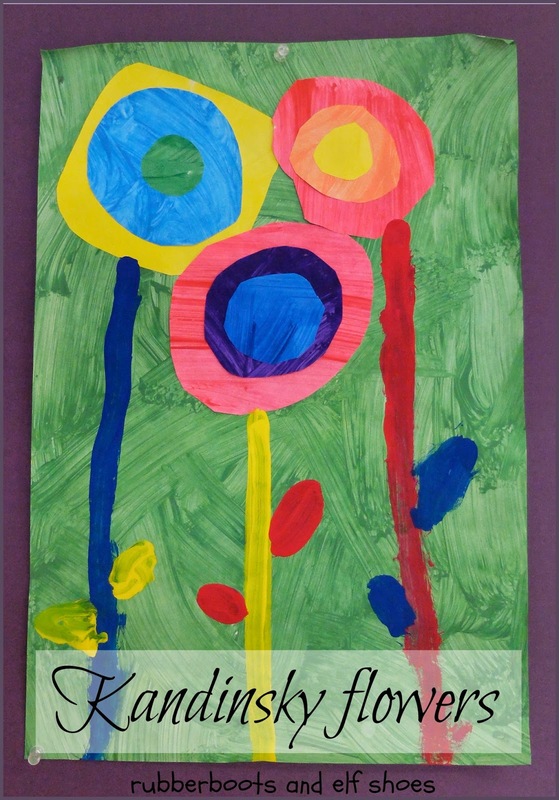 One of the flowers had to have a red circle, a blue circle, and a purple circle. A red, yellow and orange circle. And a yellow, blue and green circle. The kids chose which was small, medium and large - because they were the artists. They cut out the circles - either drawing circles or "curvy corners" on the back, or cutting free hand. 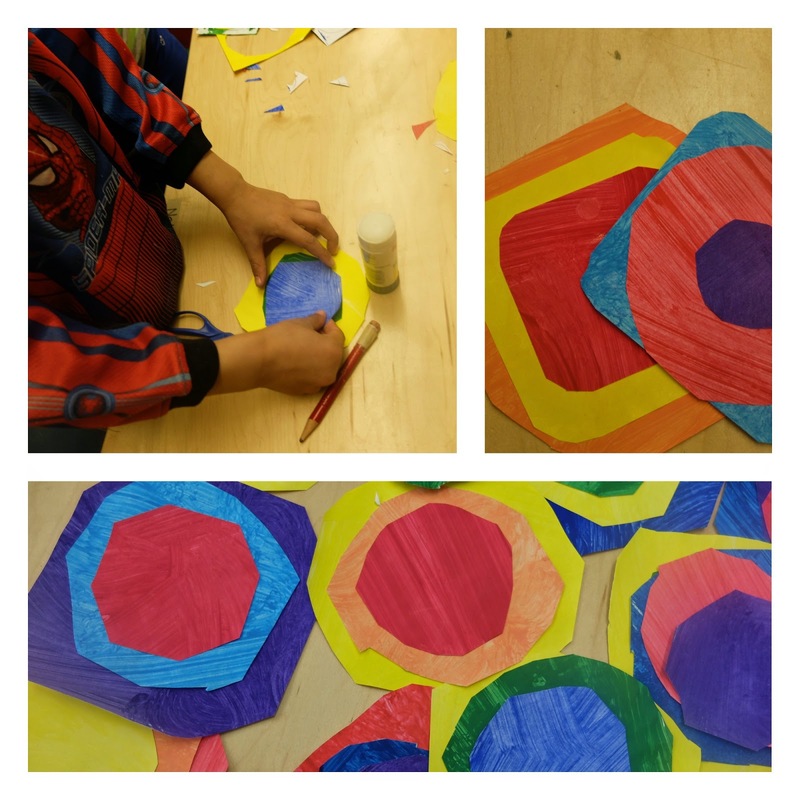 The circles looked gorgeous when they were glued together. Since we were making flowers, we needed a background. We "smooshed" yellow and green paint spatters together with a sponge. 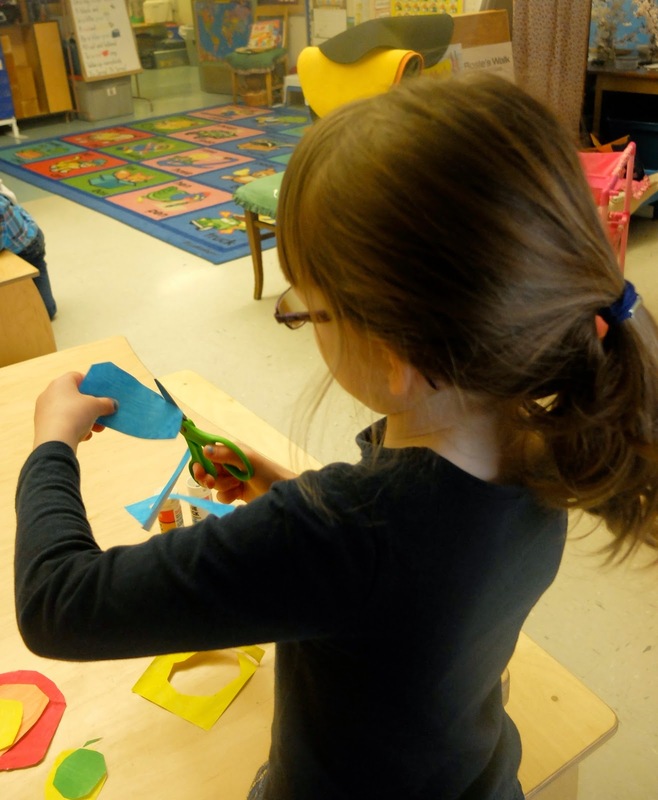 More colour mixing and texture creating. and painted stems - straight or wavy, and whatever colour(s) they wished - and leaves, if they wished. Those are beautiful, Sandi. I'm pinning! Thanks, Barb. I am pretty delighted with them too. Thanks :). It is my pleasure to work with artists. These are beautiful!! I think I will have to figure out some way to incorporate these into my Mother's Day gift. Thanks for sharing. They would look great as a mother's day card. Beautiful! Thank you for linking up to the Thoughtful Spot Weekly Bloghop! Thanks. The kids are pretty pleased with their work. Gorgeous sprint art! I love how these turned out, and your tutorial is great. Thanks for sharing at After School! What beautiful artwork! I am going to try this with my kids this week. I just took a book out of the library on Kadinsky. We may have to try these beautiful flowers after reading it! Thank you for sharing at Sharing Saturday! !